Meghan Markle has already proved her fashion credentials by being the unofficial guest of honor at 2018's Fashion Awards, and presenting Givenchy designer Clare Waight Keller, the woman who made her wedding dress, with British Designer of the Year for Womenswear. Earlier today, though, the Duchess of Sussex used her love of fashion for a greater cause. Markle, 37, who is pregnant and expecting this spring, also revealed that she's been working with Smart Works for months now. "I'm so happy to be here. You guys know I've been quietly coming by... close to a year. It's nice to be able to now do it publicly and really talk about the work that you do." It was also revealed today that the duchess has taken on honorary roles with the National Theatre and Association of Commonwealth Universities, patronages previously held by the queen. So what did her styling tips at Smart Works include? She chose classic minimalist pieces for Patsy Wardally, a 55-year-old who secured a role at Gatwick Airport with the help of the charity. Selecting a tan cape, black bag, and a red and white dress for Patsy, the duchess said: "I am so happy to be here." 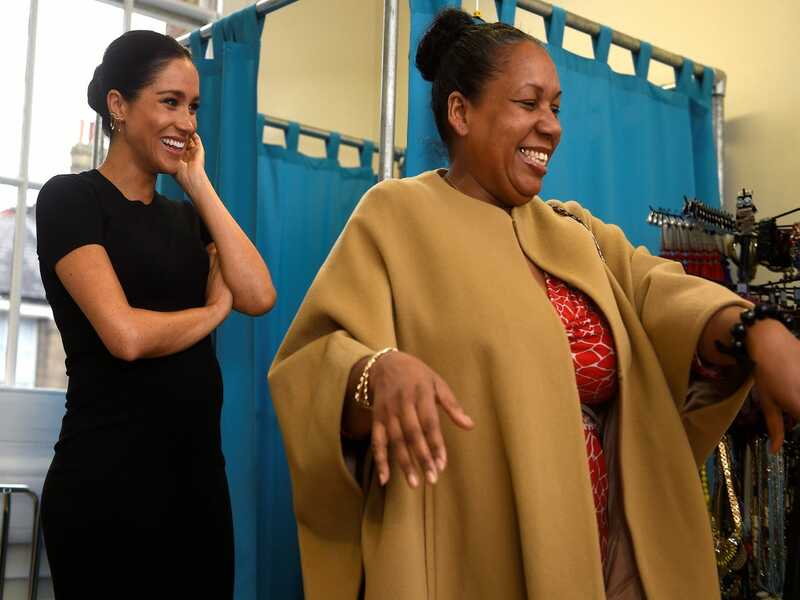 Smart Works' chief executive Kate Stephens said of Markle: "She's really hands-on and involved, and has a natural empathy with people that we've been really impressed by; she's amazing. She puts people at their ease. It does feel slightly surreal." Tackling maternity style with aplomb, Markle wore a sleek ensemble of Victoria Beckham's Vanity Box bag (Beckham's brand is a favorite of the duchess), monochrome Giovanni Rossi pumps, a tan Oscar de la Renta coat, and a black dress from maternity brand Hatch. While Markle's support and celebration of the British fashion industry has been made clear for some time, it's fantastic to see her apply that to a positive cause.